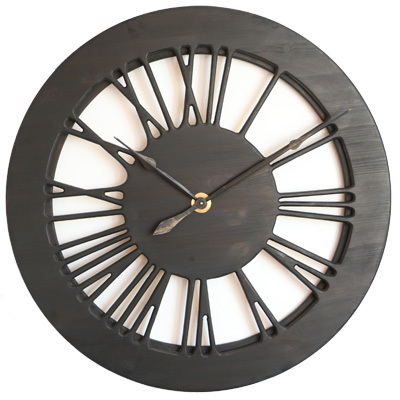 This wonderful black skeleton wall clock has a face made from a single large panel of pine wood. There is additional narrow rim attached at the back. The black clock face is displaying beautifully hand carved Roman Numerals and the wall colour is visible in the background. With its classic three dimensional design, the “Light Heban” will blend well in most interiors. This incredibly impressive black skeleton wall clock is one of the most affordable products among our skeleton timepieces. Are you looking for an amazing work of art that will wow all your guests? If you prefer simple but elegant look then “Light Heban” is your best choice. 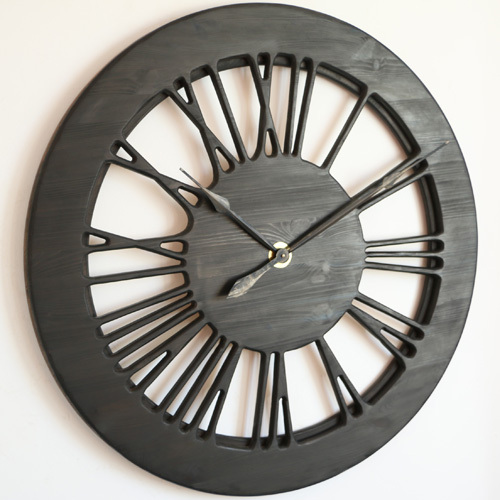 Like all other timepieces in our online shop, this black skeleton wall clock is handmade from wood. The front displays large roman numerals and the narrow wooden rim attached at the back provides three dimensional character. The clock mechanism requires a single C-Cell battery that should work for more than 9 months. When we deliver it we detach both hands to prevent any damage in transport. Once you receive the clock you can read the instructions provided and watch this short video on Youtube where I explain how to set the time. 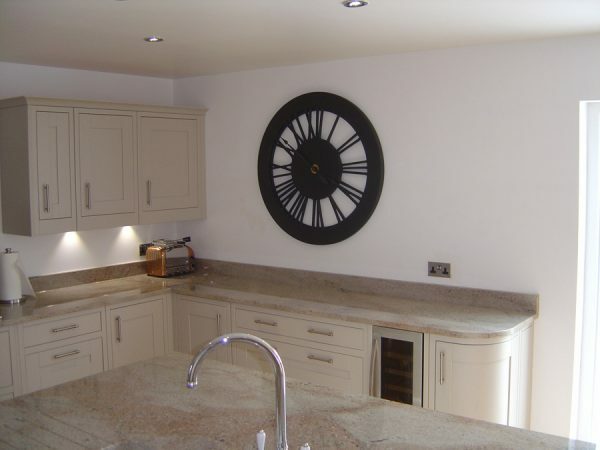 You can mount this fabulous timepiece in any room in your house, office or luxurious restaurant. Just make sure to read our Terms and Conditions and avoid any direct heat or moisture. 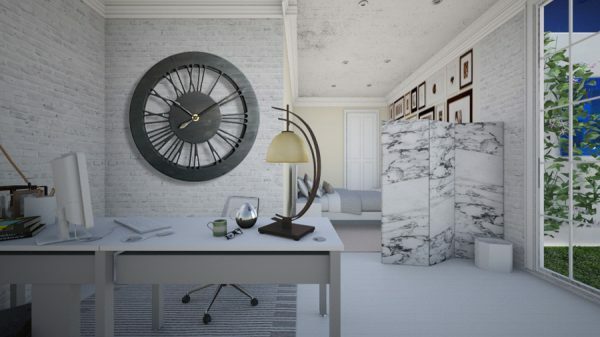 Please visit our blog section to read more about the history of our skeleton wall clocks. You are also most welcome to join Peak Art Facebook Community to share your comments and feedback. Do you have more demanding taste and are looking for something different? Our handmade clocks aren’t available in any other online or physical shop. 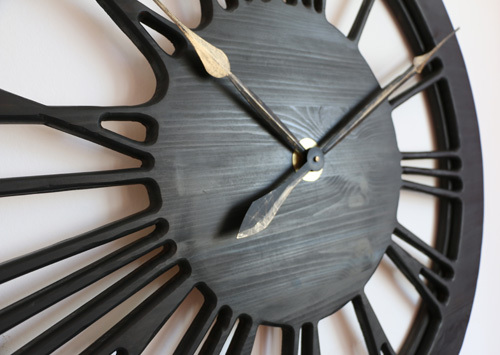 We are not simply distributor but a small family business specialising in designing and hand crafting statement clocks. While we are based in UK we can ship them to many other countries around the World including Australia, United States, Canada, Europe. There is no need to compromise on uniqueness and style anymore. We are filling the void that exists in this niche market so please embrace our handmade wooden clocks.